From thousands of years ago to now, motifs were mostly symbolic and associated with metaphorical concepts in Middle East carpet weaving. The patterns used in these rugs are abstract. These patterns are influenced by climatic and ethnic conditions in terms of form and color. The weather in this area is warm and dry. Therefore, we see that the forms are far from any curved and soft form. 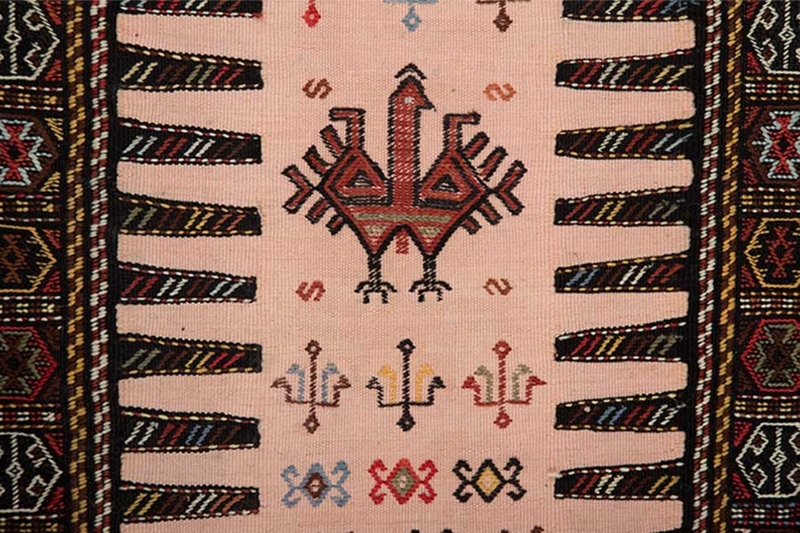 This type of kilim is woven by women of a tribe named “ keremaj” who reside in northeast of Iran. This tribe is a memorial to the ancient tribes of Iran and they have a historical background of more than three thousand years. People of Kirmanj are renowned for their courage, dignity, hospitality and kindness. The presence of the Kirmanj in the villages is more evident than in the cities because their main job is either farming or animal husbandry. Nature has a very important role in forming the patterns and colors. 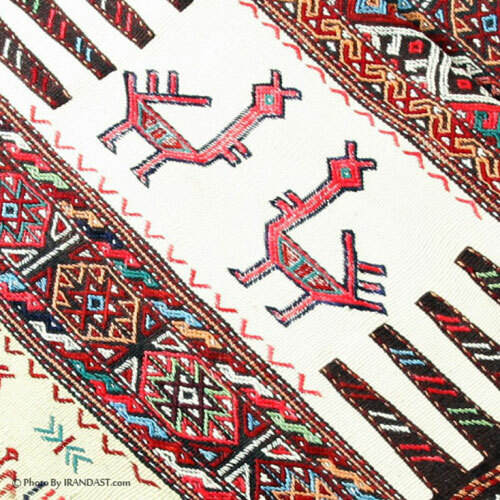 The use of symbols by weavers to create a rug pattern is one thing and the invention of these symbols by knitters of other centuries is another. Younger generation learns symbolic form from the older generation and this goes on. The weaver selects the form and uses the pattern to make a beautiful rug and in many cases she does not know the meaning of the patterns she applies in weaving the rug. Even when a rural woman does not use the conventional pattern and creates new patterns, she does not always know what her inventive pattern means. For example, the wheat pattern means fecundity and soil fertility, but when a rural women weaves this pattern it is because she thinks it is beautiful and decorative and that it can make a good combination with other forms used in the rug at the moment. 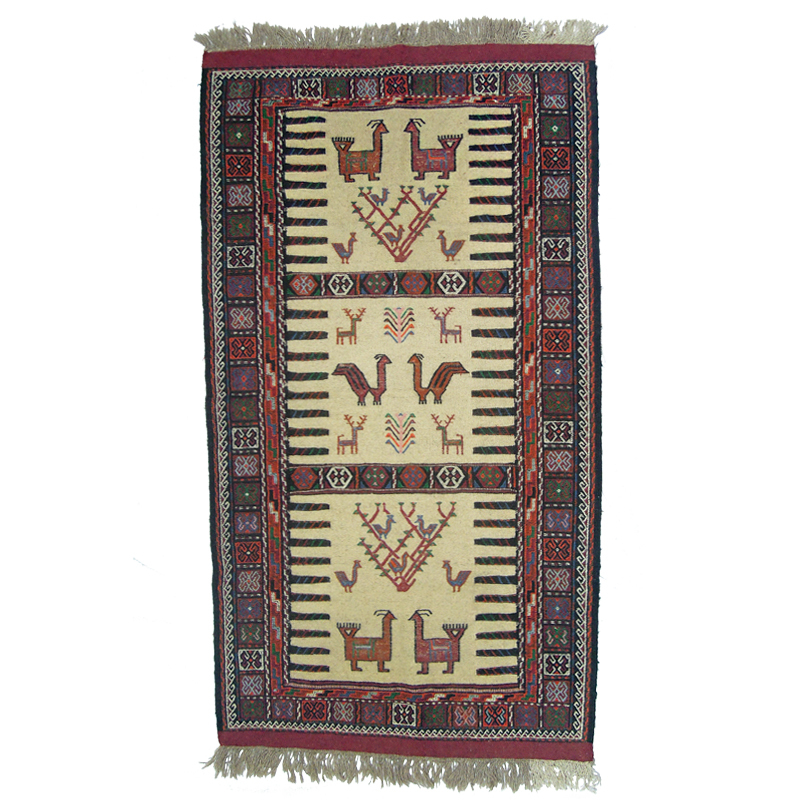 On the other hand, the bold presence of nature in the life of “Krimanj” women has an important role in using or creating the motifs in weaving rugs. What the weaver sees in nature is translated to combinations of vertical, horizontal and diagonal lines and various geometric forms. There is no detailed information on how and when the symbolic patterns are formed because rug and carpet weaving is an ancient art. It is so far away in history that we have no access to evidences that can show the roots of patterns. 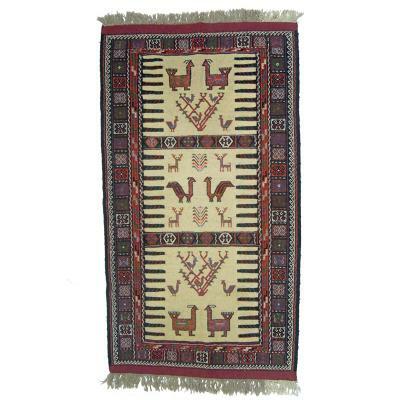 However, some of the carpet designs are a continuation of mythological designs and are rooted in ancient times. For example, Paisley (design) is depicted in rugs as a symbol of life. Placing Paisleys back to back, means wrath and fierce while placing the Paisleys face to face means reconciliation and peace. Placing small Paisley next to large Paisley refers to mother and children. These motifs are categorized in five groups. Geometrical, animal, plants, human and Mythical patterns. 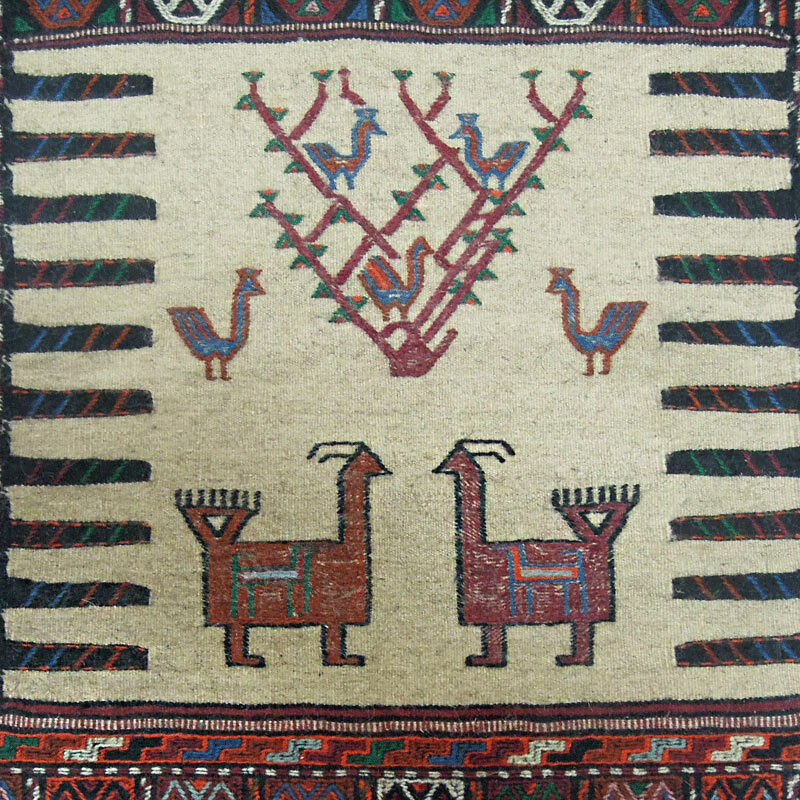 Living environment, intellectual beliefs, cultural components and the feelings of weavers are very important factors that have influenced the creation of these motifs. Color is a very important factor in creating these rugs. 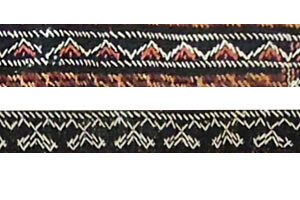 While the motifs do not change, the colors differ from one rug to another. The weaver chooses the colors according to her taste and feeling at the moment of weaving. In most cases colors are very strong and bold because of the influence of nature around her on her mind. Flowing water is usually woven on the edge of the rug and is a symbol of life as a primary element of which everything was created. Water is also the symbol of womb, fertility and procreation. Tree is one of the richest and most popular themes. Tree is a symbol of life because of the successive change during different seasons. Heading to the sky, tree is the symbol of endurance, growth and SUBLIMITY. Tree makes a connection between three levels of the universe. Surface level (trunk), deep ground (roots) and the sky (branches) and it collects four elements of water, air, fire and soil. Many ancient tribes call the tree as God's place or the god itself. Tree is also the symbol of immortality. Bird symbolizes the life after death. Ancient people in this area believed that the flying bird indicates the arrival of the soul to heaven because a bird in a cage visualizes the soul in the cage of body. When the soul leaves the body it is like a bird flying away from its cage. Bird is also a symbol of sky, freedom and dreams. 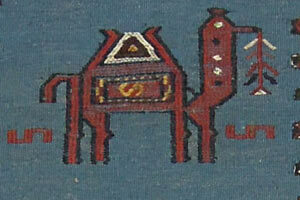 Camel symbolizes the migration. In the past, camels played a major role in nomadic migration. 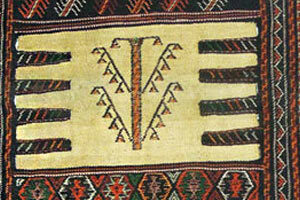 For this reason the weaver typically uses this motif in the center of her work. Most of the human motifs are women. Because the weaver tries to depict herself. While man is at the end of the evolutionary path, snake is at the beginning of the path with no hands and feet. In other words, there is a snake in every human which presents his dark and undeveloped side that should be defeated. Rooster means awareness, energy and perseverance. It also means masculinity, fight and jealousy. It is a symbol of pride that can be seen in his behavior. The sound of rooster means that the night has passed and the day has come which means happiness and bliss. Dog is a symbol of loyalty, care and support. In ancient mythology, dog is also a symbol of conformity and consistency. Eagle is the symbol of power and ability. It also symbolizes freedom and immortality. Eagle has a high spiritual rating among other animals. .